DM (Eds.). Mammals species of the World, a taxonomic and geographic reference. of Natural History 236: 1-367. Publications, Museum of Zoology, University of Michigan 1-41. The University of Michigan 721: 1-35.
edition. The John Hopkins University Press, Baltimore. pg 569- 1362.
on the analysis of type material. Tese de doutorado, Texas Tech University, 320 p.
Atlantic forest of eastern Brazil. Acta Theriologica 47: 307-322. Sigmodontinae) in Misiones, Argentina. Mammalian Biology 68: 129-143. Museum of Natural History 244: 1-306.
characters. Mammalian Biology 69(4): 238-257. Pessôa LM & SF dos Reis. 2002. Proechimys albispinus. Mammalian species 693: 1-13.
subgenus Trinomys (Rodentia: Echimyidae). Zeitschrift für Saugetierkunde 57: 39-46.
nacional, Rio de Janeiro 63(1): 161-168. Southeastern Brazil. Zootaxa 431: 1-11.
sistemática de las entidades del género Ctenomys (Rodentia, Octodontidae). I.
Exactas y Naturales. Contribuciones Científicas, Zoología 2(6): 299-352.
y Ciências de la Universidad de la República Uruguaya 18: 257-276. Museu Paraense Emílio Goeldi, Zoologia 16(1): 65-73.
water relations. Annals of Carnegie Museum 51: 109-126. Streilen KE. 1982a. Ecology of small mammals in the semiarid Brazilian Caatinga. I. Climate and faunal composition. Annals of Carnegie Museum 51: 79-107. Streilen KE. 1982b. Ecology of small mammals in the semiarid Brazilian Caatinga. IV. Habitat selection. Annals of Carnegie Museum 51: 331-343.
of Natural History 76: 151-229. 1826 (Rodentia, Ctenomyidae). Iheringia, Zoologia 60: 123-124. - a taxonomic revision. Tese de doutorado, University College London, 316 p.
(Rodentia, Muridae). 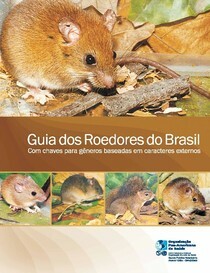 Revista Brasileira de Zoologia 17(1): 183-186. Echimyidae) from French Guiana. Mammalia 60(3): 393-406. Vieira COC. 1948. Nova contribuição ao conhecimento dos mamíferos do Rio Juruá. Boletim do Museu Paraense Emilio Goeldi 10: 239-274. Sigmodontinae) com uma análise filogeográfica de B. griserufescens.